“Humility is not thinking less of yourself, it’s thinking of yourself less” -C. S. Lewis. Humility is often claimed as an important facet of human behaviour. It is humility which makes a leader, a leader for the masses. This quality makes a leader more approachable and trustable for the people. A leader is one who needs to look after its people, thereby creating a connect with his people. That connect can only be established when the leader is humble enough to listen to the miseries of his people and help addressing them. In the present ruling dispensation there seems to be lack of humility among the leaders. The voice of the public is being ignored and they are being treated as mere subjects to the rulers. The Government is implementing arbitrary rules without any proper rationale. The ordinance brought in by the ruling NDA government altered various provisions of the Land Acquisition Act 2013 bypassing Parliamentary scrutiny is a perfect example of the same. When the bill was tabled in the Joint Committee of the Parliament, many clauses of it were found to be impractical and arbitrary in nature and thereby “The Right to Fair Compensation and Transparency in Land Acquisition, Rehabilitation and Resettlement (Second Amendment) Bill, 2015” was brought in to alter the provisions of the ordinance. This shows the high handedness of the government to bring in laws without consulting the or taking into consideration, the effect that of the law. The laws being implemented highlights the government’s shift to favour the industrialists opposed to the promise made by it, of supporting and eventually uplifting the conditions of the poor people of the country. Whereas we can find leaders of the stature of Shri Rahul Gandhi who try to reach to the grassroots of the problem faced by the citizens of the nation. Thereby affirming that the farm loans is not an end to the miseries of the farmers, but just a step forward. He admitted that there needs to be consultations held with the stakeholders to come up with ways to help the agrarian sector out of the deep crisis that it has found itself in. Political leaders need to realise that it is only because of the support of the public, that they have claimed themselves to be leaders and representatives of the public. Leaders need to learn the art of displaying humility, so as to encourage people to come up with their problems to them and find solutions for the same collectively. Humility is very important in a democratic setup as their ought to be difference in opinion but those differences also need to be taken into consideration. Humility will facilitate a leader to consider all such differences and hold consultations with all the sections of the society, whom a particular decision of the government might affect. Thus giving importance to the democratic setup of debate, discussion and deliberations. 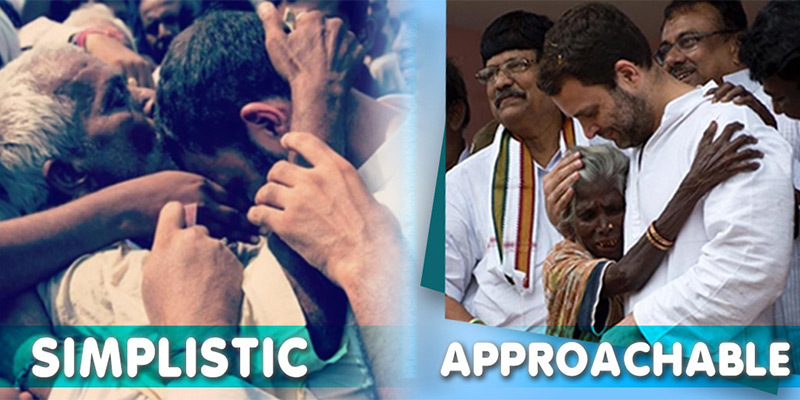 The Congress President also lays emphasis on the fact that “Humility is our strength, not weakness”. By downgrading the importance of humility, we are only downgrading our social standards. Politics should encourage us to be humble and respect every individual. The idea of Unity in Diversity will only gain traction in public life as our leaders display humility and encourage public to be humble.